With a brief digression to frozen fruit bars, this will take us to apricot bars (as baked by Monique Serpette Transue) and other cookie-like finger foods based on dried fruits (something of a challenge for taxonomists of food). Crust plus fruit filling, in easy-to-handle rectangles. Cream together softened butter and sugar in a large mixing bowl. Add flour and salt and mix until blended. Press into the bottom of prepared pan and bake for 15 minutes. 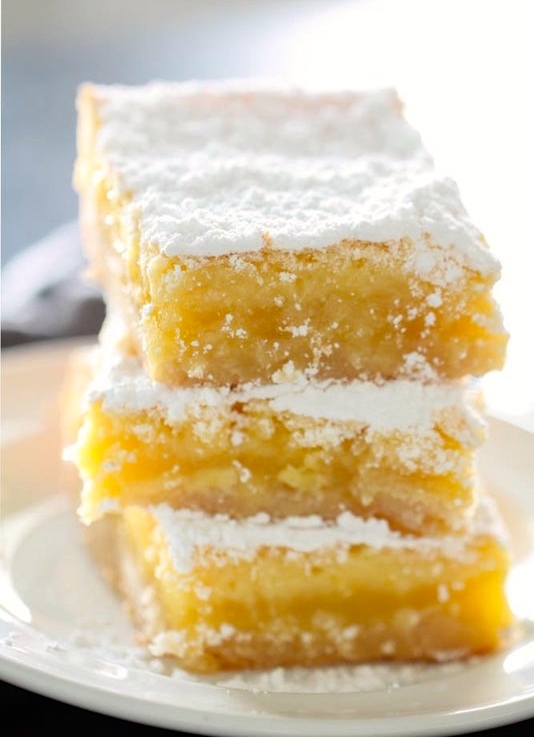 While crust is cooking, make filling by mixing together sugar, eggs, lemon zest, lemon juice, and flour. Pour filling over hot crust and bake for about 25 -30 minutes or until set. 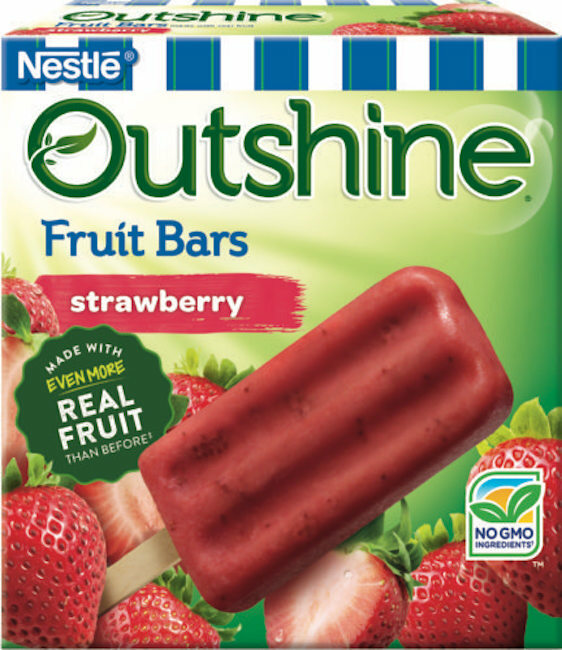 The bars aren’t easily placed in a taxonomy of (sweet) foodstuffs: they’re like COOKIES, like (small) CAKES, like CANDY (compare granola bars, fruit leathers, etc.). Monique’s apricot bars / squares / crisp cookies. A regular treat in the Transue-Zwicky household for some years. From Jacques’s viewpoint, his mother has five special recipes. Two of them — the apricot crisp cookies and the (yellow) fruitcake — are irrelevant to our story, because every time J. leaves Monique for our place, and every time she comes to our place, she supplies us with significant amounts of these two. Actually, J. adores the apricot crisp cookies, and who wouldn’t, but though he likes the fruitcake well enough it’s not one of his special things. That leaves the raised waffles, the bread (even J. realizes making bread is a hassle, so he hasn’t been pushing this one), and, oh my, the gnocchi — semolina gnocchi, not potato gnocchi. Cook until tender, almost dry. Cool. Keep out 3/4 cup of this mixture. Put remainder into pan. Spread with apricot. Sprinkle the 3/4 cup of mixture on top. Bake at 350 F. for 25 to 35 minutes. Cut into pieces when partly cool. It will make two 8 in. square pans full. Put the apricot-cooking pan in water immediately [AZ: before the crust mixture irrevocably bonds to it; the lemon bars recipe above uses nonstick spray to avert the problem, but I believe Monique thought that Pam and its kind were works of the devil]. It is a nuisance to cut them up. I do it, or rather Bill does it, in the Cuisinart. Yes, Bill did it, with great care. And then had to clean the Cuisinart. I bathed in the reflected warmth of her extravagant love for Jacques, her favorite of her three sons, but even I could never have gotten away with using — insert French derogatory expulsion of breath here — JAM. This entry was posted on October 9, 2018 at 3:42 pm and is filed under Categorization and Labeling, Language and food. You can follow any responses to this entry through the RSS 2.0 feed. You can leave a response, or trackback from your own site. Reminds me of Aplets and Cotlets — a PNW favorite!